The dominant force in the Photo-Secession group he founded, Stieglitz exerted profound influence on the development of American creative photography in the twentieth century. His efforts to establish this medium as a fine art are perhaps best remembered through his first magazine, Camera Work, which appeared from 1903 to 1917. This large-format photogravure was produced by a photochemical printing process for the art magazine 291, published by Stieglitz in 1915 and 1916. The magazine was named after his New York gallery at 291 Fifth Avenue, where he promoted modern art- primarily photography, painting, and sculpture. 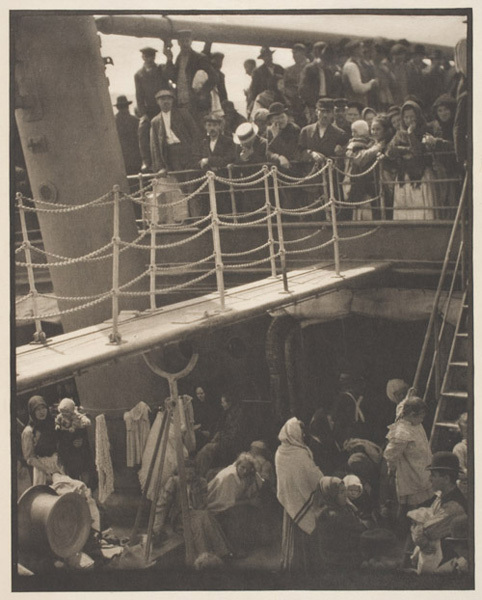 Stieglitz regarded The Steerage as one of his best works. Using a hand-held four-by-five camera, he captured on an eastbound Atlantic crossing this poignant picture of steerage passengers who, having been rejected by United States immigration officials, were being sent back to Europe. Attracted to the abstract compositional elements of the scene, Stieglitz recalled: "I saw shapes related to one another- a picture of shapes, and underlying it, a new vision that held me: simple people; the feeling of the ship, ocean, sky. . . ."